Drawing in order to see. I’m intrigued by the way in which the act of sketching gradually unwraps the object in question. In the effort to draw something, more and more becomes visible. It was only through drawing the teasels in the garden that I came to appreciate the beautiful design of the leaves; like folded paper boats with the stem as a majestic mast, each catching little pools of water to entice passing traffic to stop a while. 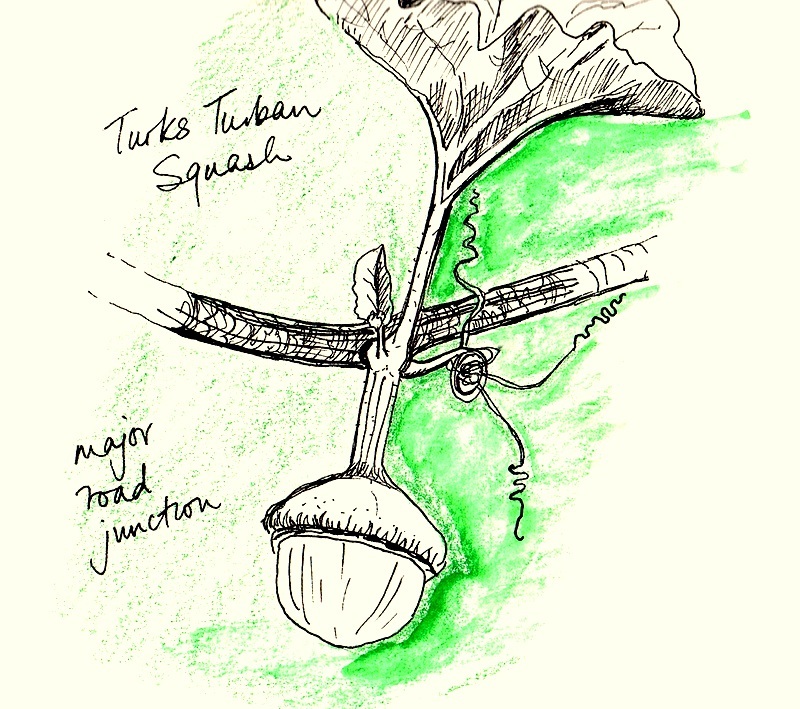 Sketching the squash that is taking over my garden fence similarly revealed another previously unrecognised design; the joints are like major road junctions with flowers, fruit and tendrils all emerging from the same area. These sorts of details don’t immediately strike me. I have to look ‘properly’, and that is what sketching involves. But there is always more! There is a step beyond, where I stop trying to faithfully reproducing every leaf or junction, but convey what I have understood with simplified marks. First I have to see it, then draw it, then discover how it really looks and redraw until I have ‘got it’. Next I need to digest this knowledge and draw whatever it is simply, economically, authentically, symbolically. There’s a similar process in writing, but I wouldn’t have framed it in this way without the sketching link. I’m thinking here about the various characters in my fiction writing. First I have to get to know them, and as I note down their story I find out more about their families, their relationships, their history, geography, and culture. I discover how they look, what clothes they like to wear, and how they speak. I’m creating a drawing and discovering all sorts of details that I didn’t know when I first began to write. Then as they become life- like and substantial, I have to condense all this information into one or two phrases, or even words. Every time they enter the scene I can’t regurgitate all the information I have about them and expect to keep the story alive. Writing ‘The Wednesday Group’ largely rests on dialogue – it’s supposed to be a psychotherapy group, after all! That’s what we do – we sit in a circle and talk, hopefully to each other! Learning how each of the characters speaks and then capturing it in the writing is the key requirement here. Perhaps as young children we can see more of the complexity. As we grow we have to learn to condense and simplify in order to create a manageable pathway through our experiences. We learn shortcuts and often lose the wonder in the process. There’s another article brewing here about short cuts in therapy, but that’s for later. Right now it feels good to be back at the beginning stage, rediscovering what is in front of my eyes … if only I go and find my sketchbook! This entry was posted in Uncategorized and tagged condense, drawing, John Ruskin, learning to see, seeing, shortcuts, sketching, The Wednesday Group, wonder, writing on September 2, 2013 by Chris.